Six young math wizards returned with three silver medals and three bronze medals from the 58th International Mathematical Olympiad held on 13-23 July in Rio de Janeiro, Brazil. The most prestigious pre-college mathematics competition in the world gathered the best and the brightest from 111 countries who competed individually as they solved three difficult, original math problems. Dr. Richard Eden of the Ateneo de Manila University and Dr. Louie John Vallejo of UP Diliman led the team composed of high school students from public and private schools. Although unable to match last year’s success at two gold medals, missing the gold cutoff by a single point, the team still managed to defend its position at 17th place. It was also the first time for all six contestants from the Philippines to bag medals, a feat on its own. 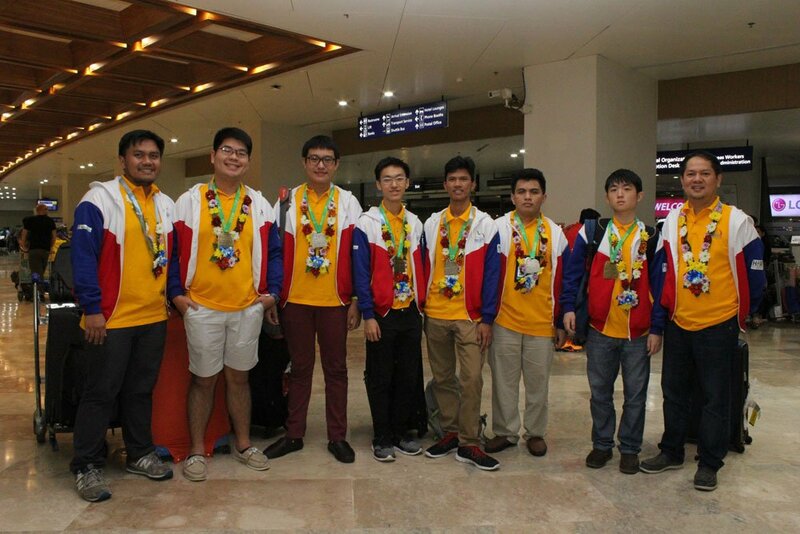 From left: Dr. Louie John Vallejo, Clyde Wesley Ang (bronze), Farrell Eldrian Wu (silver), Shaquille Wyan Que (bronze), Albert John Patupat (silver), Kyle Patrick Dulay (silver), Sean Anderson Ty (bronze) and Dr. Richard Eden arrive at NAIA Terminal 1 after the 10-day competition in South America. Photo courtesy of DOST-SEI. Vallejo, who has been co-training the Philippine team for some years, is an assistant professor at the Institute of Mathematics in UP Diliman. Other members of the institute who helped train the participants were Dr. Jerome Dimabayao, Carlo Francisco Adajar, Russelle Guadalupe, Diane Christine Pelejo and Gari Lincoln Chua. The IMO, established in 1959, is the oldest of all science olympiads. Some outstanding mathematicians such as Artur Avila and Maryam Mirzakhani distinguished themselves in the IMO in their youth. In 2014, both were awarded the Fields Medal, often described as the mathematics’ equivalent of the Nobel Prize.